ROCHESTER, N.Y. -- The Rochester Red Wings rallied to beat the Syracuse Chiefs 4-3 Tuesday night at Frontier Field. Tuesday's win ended a nine-game home losing streak for the Wings.The series continues with a 12:35 p.m. weekday matinee Wednesday, another $1 Wednesday with $1 Zweigle's hot dogs, peanuts, chips, and Cracker Jack. Syracuse opened the scoring in the second inning after Rochester starting pitcher Dietrich Enns allowed a pair of one-out hits. Following a double from Jacob Wilson, Moises Sierra singled home Wilson, giving the Chiefs an early 1-0 lead. The Chiefs scored again in the third after a leadoff double from Tuffy Gosewisch was followed by an RBI single from Andrew Stevenson to increase the Syracuse lead to 2-0. Rochester took the lead in the bottom half of the third against Chiefs starter John Simms. 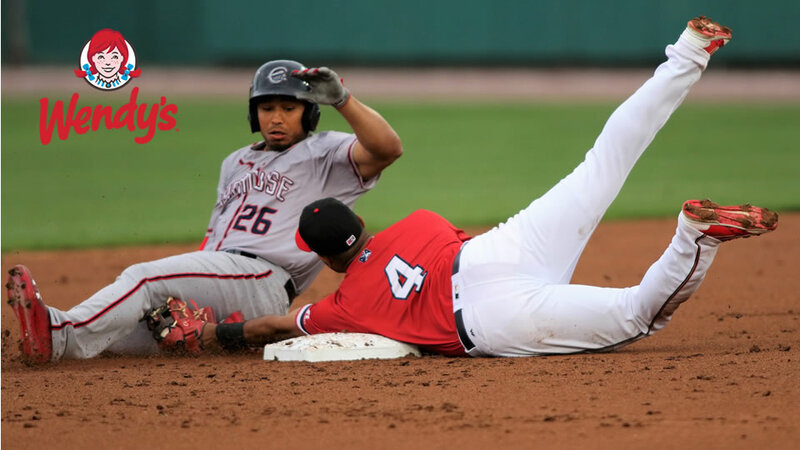 Following a single from Gregorio Petit to open the inning, Nick Gordon reached first base after an error from Syracuse second basemen Adrian Sanchez. The error allowed Petit to reach third base, putting runners on the corners. Jake Cave then doubled, scoring both Petit and Gordon to tie the game at 2-2. After LaMonte Wade worked a walk with two outs, both Willians Astudilloand Cameron Rupp recorded RBI singles to extend the Rochester lead to 4-2. After going 1-for-40 with runners in scoring position during the previous homestand, the Wings recorded three hits with runners in scoring position during the third inning alone and would finish the game going 3-for-8. Syracuse tacked on a run in the forth after Yadiel Hernandez scored from third on a wild pitch from Enns, cutting the Rochester lead to 4-3. After putting a pair of runners on in the fifth, Simms was pulled from the game. Simms went 4.1 innings allowing four runs (one earned) on six hits while walking three and striking out one. He threw 87 pitches, 53 for strikes. DJ Baxendale replaced Enns to begin the sixth. Enns went 5.0 innings allowing three runs on six hits while striking out two and walking two. Enns threw 94 pitches, 60 for strikes. Baxendale found himself in a jam during the seventh inning after allowing a pair of hits to put men on the corners with one out. He avoided further trouble after getting Sanchez to ground into an inning ending double play. Luke Bard came on to begin the eighth inning in place of Baxendale who threw 2.0 innings allowing no runs on two hits while striking out four. Bard allowed two hits in his inning of relief, striking out one. John Curtiss worked the ninth inning, striking out two in a perfect relief inning to earn the save. Byron Buxton went 0-for-4 with two strikeouts as the designated hitter, in his first game of a rehab stint. The Wings won despite getting out-hit 10-6. NOTES: Twins OF Byron Buxton joined the Wings on a rehab assignment Tuesday...INF Leonardo Reginatto was activated from the disabled list Tuesday...Jake Cave's RBI double in the third increased his Triple-A on-base streak to 16 games.